'Gone Fishing' wins another festival... that's thirty something by my counting! I am in the deepest darkest depths of this corporate job and slowly losing my mind, as one does during production. But a little ray of sunlight glimmered last night when I got word from the Indianapolis International Film Festival that ‘Gone Fishing’ won the Best World Cinema short award. WOW! 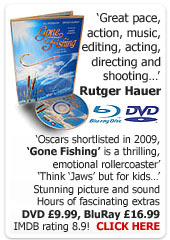 We have won a couple of ‘Foreign Short’ or ‘World Cinema’ awards for ‘Gone Fishing’ while playing in the USA and it’s always seemed odd to consider ‘Gone Fishing’ as a foreign film – I think of foreign films as being in a different language to the native language, coming from Eastern Europe, the Middle East or Asia. I know technically ‘Gone Fishing IS foreign - I guess it says a great deal about where I consider my cinematic home and future to lie. And the award goes to... the film maker who is not present! WOW! But… as I am shooting right now, sadly, I can’t attend the festival (or reveal the festival just now). Bummer. So I had to decline. And so she then asked if I could record a video message to play at the awards, which I dutifully filmed yesterday, during the lunch break for our corporate film shoot (it's suprisingly hard to do this when you are not in the atmosphere of an event). It has always surprised me that so many festival organizers don’t contact the winners ahead of time, to extend a special invitation so that the film makers are present at the awards ceremony. What a bumper day for the FedEx man. I came back from our shoot to find two trophies for ‘Gone Fishing’, waiting patiently at the studios. First was from the Indie Fest USA awards a few weeks back, and second was from the Newport Beach Film Festival in LA where we won Best Screenplay a few months back. The Newport Beach award is solid glass and weights a ton! And I also found out today that we won ANOTHER award, Best Film at the Spirit Quest Film Festival in Pensylvania over the weekend. Here’s the email I got from Greg, the festival organiser! Chris - I am pleased to announce that "Gone Fishing" has won the award for Best Narrative Short at the 2009 Spirit Quest Film Festival! Congratulations! Thank you for making such a wonderful film! Gone Fishing Wins IndieFest USA at Disney in LA! Gone Fishing picked up it’s 31st award for Best Short Film at the IndieFest USA Awards at Disney last night. Associate Producer and LA resident Kerry Finlayson went on our behalf to accept the award – I think that makes about 15 awards she has collected for us now! She is becoming a bit of a veteran. We have a couple more awards coming up in the next few weeks, so fingers crossed! Jet lag gets me up at 5.45am, and I prepare for the PGA conference. At 8am, Andrew, who I am staying with drops me off at the Sony Studios where I collect my badge to get me into the conference, which is across the road in the main studio complex. As I walk down the backlot streets, all decked out to look like real streets for filming, I walk right past James Cameron who is on his way, with a small entourage, to his first seminar (which sold out before I even know I was coming! Doh!). Minutes later and I am in the main conference area which houses a small expo of organisations and companies like Kodak, film commissions, and special effects houses. Amazingly, the place is littered with copies of the Kodak InCamera magazine which featured a double page spread (centre pages at that) of ‘Gone Fishing’ earlier this year (original link here). Awesome. Several exhibitors are demoing new 3D TV technology. Even though I am a big fan of 3D (afte seeing The Creature From The Black Lagoon in 3D as a kid),I had been quite cynical about this ‘re-invention’, that is until I saw the demo. Frankly, it was gob smacking. Real 3D on a living room LCD or Plasma TV. So how does it work? Well first off, to get this in your home (when it arrives in high streets), all you will need to replace is your existing TV. Movies can be delivered off BluRay and I assume SkyHD if they choose. The actual TV has an active layer of polarising material over the screen, which is how the image is delivered to one eye at a time, creating the 3D effect. You still need to wear 3D polarising special glasses, and yes you do get the same old headaches. But for occasional events, such as sports, live concerts and blockbusters, there is no doubt 3D will add that little extra. The TV itself delivered normal TV images as per usual, and as I said, no extra hardware is needed. Will it take off? Who knows, but I do think the killer feature is that it’s a normal TV that can also do 3D – nothing else needed. The first seminar I attended was about breaking into the business as a producer. The panel were all great, but essentially it all boiled back down to network, network, network, and if you get a foot in the door, be excellent and on the ball. So for me, no news there, just an affirmation of what I already believe. The second seminar was much more illuminating for me – it was about story telling in the years to come, about convergence of technologies and business models, about creating communities and worlds around your project and thinking way beyond the movie. This isn’t just about merchandising and cashing in on other tie in products, it’s soooo much more. The speakers were all very good and the 'Gone Fishing' experience really fed into the basic message of creating a community around your story and involving that community where possible. The phrase ‘Transmedia’ has been coined to refer to this immersive experience where audiences evolve beyond passive viewers into collaborators, contributors and allies. It’s fascinating stuff and in some ways, part of where I sense my business models may be headed in 2009/10. The final session was with some heavyweight VFX guys, headed up by Richard Edlund of ILM fame – I later shook his hand and thanked him for an excellent presentation on previsualisation. There was an indepth deconstruction of the sky dive onto the space drill from the recent Star Trek movie, which really showed the value of extensive previsualisation. The high point for me was when the guys from Roland Emmerichs company gave us a sneek peak at a key set action piece from ‘2012’ where a megaquake hits LA and all hell breaks loose. It was fascinating to see how this all came together, and the result was audience pleasing mayhem. Apparently Roland Emmerichs key phrase is ‘Too much is not enough…’ And it showed. One thing that struck me over and over was how almost every speaker constantly used words like story, character, movie, audiences, fun, entertaining, successful, story, story, character, movie, movie… and it was always with passion and enthusiasm. It felt very different to the much colder, and dare I say, aloof way in which so many meetings I have sat through in the UK played out. A long day for sure and with the jet lag I am exhausted. Tomorrow is a day of more seminars and of course, the awards! Lucifer – According to IMDB it cost $3.5m which is astonishing (if true). There is a link to watch it here on the official site. It certainly has the production values! After the Storm - When a catastrophic hurricane rips through Florida, it leaves in its wake a wasteland of matchstick trees, overturned cars, and shattered lives. Afraid to leave his home unprotected, Perry, a dedicated family man, weathers the storm only to find himself stranded with his wife and child in the threatening aftermath. As Perry struggles to salvage what little remains, his insecurities slowly tear at the fabric of his marriage to Patrice, who wishes for nothing more than to celebrate their survival. But as tempers flair, the couple soon discovers that the storm was only a prelude to an even darker fury ahead. A Son’s War - Prague, 1939. The true story of Jan Wiener, a young Czech Jew struggling to survive at the outset of Nazi occupation during World War II. As the German army tightens its grip on the city and danger grows ever closer, Jan is ultimately forced to choose between his freedom and his mother. Snowyville – I can’t find much about this, aside from it looks like an animation that has been developed into a feature film. There and back again... The Producers Guild Of America Producers Challenge! So it now looks like I am going to LA on Thursday! It will be a whistle stop tour as I need to come back for a minor operation on my tooth next week, but for now it looks like I am going to the Producers Guild Of America’s conference which culminates on Sunday night with the awards, in which we are nominated for best Short! We are the only non-USA short drama and we are up against four other strong contenders. I have not seen any of the other films but I am certain they will all be knock out. Consequently, I have had to move the Film Sales Delivery workshop we had planned for this weekend, so if you want to come on the new dates of June 21st, we do have places. Check it out here. We also bumped one week, the hugely popular Guerilla Film Makers Masterclass, as I am going to Canada to run the very same workshop and there was an overlap. You can book here if you want to come. New dates are July 4th and 5th at Ealing Studios. At the upcoming Produced By Conference, the country’s most successful entertainment producers will converge to address the state of film, television and new media production as well as share their insight and experiences on today's competitive marketplace. More than 30 conference sessions have been designed to provide all producers—from first-timers to veterans—with the tools and insights they need to take their careers to the next level. Among the many topics to be are financing, distribution, pitching, development, “green” production, visual effects, and new media opportunities. Additional networking sessions, technology demonstrations, vendor displays and special mentoring roundtables are slated to take place throughout the weekend. Confirmed attendees include James Cameron (Avatar), Kathleen Kennedy (The Curious Case of Benjamin Button), Mark Gordon (2012), Chuck Lorre (Two and a Half Men), Marshall Herskovitz (Blood Diamond), Marc Cherry and Sabrina Wind (Desperate Housewives), Gale Anne Hurd (The Incredible Hulk), Ian Bryce (Transformers), Betsy Beers (Grey’s Anatomy), Douglas Wick and Lucy Fisher (Memoirs of a Geisha), and Thom Beers (Deadliest Catch), as well as producing teams from such companies as Marvel and Pixar. What a line up! I hope to bring you as many insights as I can from the front line. And the award goes too... ALL OUR ASSOCIATE PRODUCERS! The Indie statuette is a 24K gold-plated figure holding a star and is mounted on a piano finished base of rosewood. It is a beautifully crafted award. This engraved, distinguished achievement award is 15" tall and weighs over three pounds. The Indie is manufactured by the company that makes the world's most prestigious and celebrated awards, the Oscar, Emmy, Clio, and MTV Video Music Awards. The Indie is truly a work of art. So if you are an Associate Producer on Gone Fishing and have not heard from me about this trophy via email, and if you want one, drop me a line ASAP and I will get back in touch in due course. We are not involved in the actual transactions and are not making money out of this opportunity, we just wanted to share the fun with those who feel like it might be an entertaining addition to their mantle piece! No really, watch it! OK. So we won. Against stiff competition too, 20 films in all. It was a great evening which went on into the warm Bahamian night. This has been a great festival and I have been lucky enough to make lots of new American friends who I plan to look up next time I am in LA and San Francisco. I also met Laurence Fishburne who was extremely articulate, charming and smart. Blimey! I was really overwhelmed too, by the amount of people who seemed genuinely delighted that our film had won, and it was very humbling as many of them had themselves made great movies and walked away without an award. I was also amazed at how many powerful Industry people were here, and all of them wanted a DVD of the film – good job I had 20 'NTSC screener' DVD’s in my bag! There is even the glimmer of several new opportunities that have arisen from the whole rollercoaster – don’t want to say anything yet, but let’s see how things evolve. The trophy, which is really stunning, is going to be engraved and forwarded on to us later. I can’t wait to get it onto the mantle piece! Right, I need to sleep now, and when I wake, it’s back to writing my script! The BIFA’s came and went, and sadly, we didn’t win best short film. It was won by social realist drama ‘Soft’, about a group of hoodies terrorising a boy and his father. We didn’t shoot a video at the awards as BIFA told us, strictly no cameras! It was star studded for sure, and with James Nesbit hosting, cracking very personal gags smattered with four letter expletives, I can see why there was a ‘no cameras’ policy. It was very entertaining though! I was delighted that Danny Boyle’s outfit won ‘Best Film’ for Slum Dog Millionaire as it’s a film with aspiration and optimism. For me it stood out among the other films, although all the features nominated were excellent movies. Very high standard indeed. The highlight of the evening for me, was meeting Col Needham and his delightful family. Col set up the IMDb many years ago and was one of the Jurors at the BIFA’s. After the awards, we bumped into each other and he shook my hand, confiding… ‘I don’t know if I should tell you this now it’s all over, but I voted for your film…’ What a nice guy! At the awards, I also bumped into the very lovely Martin Butterworth from Creative Partnership who so kindly designed our poster for us. He was delighted that we had been nominated and reminded me that my original goal had been the Oscars… So it’s all fingers crossed for the shortlist which will be announced some time in December! The Thunderclap award arrived in the post the other day, and it’s now sitting on my shelf next to the Rhode Island Award and the curious TCM White Plastic Cube Award we picked up a few weeks ago. The Kodak award is a plaque and is on my mums wall, amusing the neighbours. "The Thunderclap award is a TRULY independent award for independent film makers by independent film makers that I am very proud to have been a part of." Hello. Kirk Monteiro from Thunderclap here. 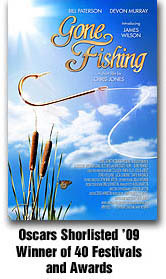 That was a quote from Chris Jones, who was overwhelmingly voted the winner of the British Thunderclap Award 2008 with his beautiful film "Gone Fishing". We've got some exciting news we thought you'd like to hear about a brand new Chris Jones, project, news from the Blaine Brothers who came second, plus vampires, money, nights out and more from the world of British independent film... Read on! New Chris Jones feature in development - "Project Nightwatch"
The big exciting news this week is that Thunderclap Award winner Chris Jones has announced the launch of his new project, a feature length ghost thriller currently working under the title "Project Nightwatch", which he's been quietly mulling over for a few years now and is due to start shooting in February. It's been a while since Chris has shot a feature. He certainly proved his worth with the low budget thrillers "White Angel" and "Urban Ghost Story" several years ago. However, since then he's found himself sidelined into writing the very popular Guerilla Film Makers series of books, and away from the actual directing and producing of films. But he's now back at the helm of a feature, and we wait with baited breath to see what the by now very experienced and knowledgeable Mr Jones is able to produce in "Project Nightwatch". His recent Thunderclap Award winning short "Gone Fishing" has shown he's developed much as a film maker since his previous features. We're expecting a beautifully shot, finely crafted and captivatingly chilly story. We'll be following the development of this film very closely and sharing with you Chris's thoughts and experiences from beginning to end. Newsflash - Blaine Brothers really nice guys! We told you a couple of weeks ago how Chris Jones, the winner of the British Thunderclap Award, gave a special mention to the Blaine brothers, who came second with their short comedy "Hallo Panda". "It's delightful to come second (in the Thunderclap award), but more delightful to come second to Chris Jones. Chris is, aside from being an award winning filmmaker, the author of The Guerilla Film Makers Handbook. What's more it's the book that got my brother and me started so quite literally without Chris Jones we'd never have come second. Being beaten into second place by Chris Jones feels like the best defeat I've ever had!" That's what I love about the British independent film makers scene. Rather than the back-biting bitterness that can often be found in other media industries, our scene is very much full of people like Chris Jones and the Blaine brothers, who realise that we're all one big creative family and are always there to support each other. It's truly uplifting to be part of such a nice guy network! Let me join in this happy back slapping and say that The Blaine Brothers, Chris Jones and all the nominees in this years Thunderclap award truly deserved every single vote they got. I have had literally hundreds of amazing emails, congratulating me on Gone Fishing and the Thunderclap awards. I wanted to thank everyone for taking the time to vote, and also for asking friends and family too vote too. Collectively, YOU made the award happen! I have been mulling over something in the last few days though, and that is the point of competitions. Running the 100 meter sprint in the Olympics is a competition too – it has a clear goal and it’s very easy to measure the outcome, and therefore the winner. But with artforms such as film, music, painting etc., it’s much harder to judge. In fact, on reflection, I have come to realise that the whole affair is a little ridiculous. Don’t get me wrong, when I enter a competition, I would like to win, for the film, cast, crew, contributors and of course, my own career. I am not naive and know that these awards significantly impact on careers. But, having been to a number of festivals now and really wondered ‘what on earth are the jury thinking?’, I am starting to question the whole business. In some cases, there really seemed to be either a political agenda or no rhyme nor reason to the outcome. This was position was strengthened at the TCM awards when I bumped into the guys who made one of the other films that did not win. I could see that they were putting on a brave face, and they felt they should have won a prize. In my eyes, I had to agree with them, they should have received a prize too. But then there is this enormous ‘get out of jail card’ which is, well that’s not how the judges felt. At the TCM awards, Richard Penfold, who won for ‘Leaving’ was gracious enough to mention Gone Fishing in his acceptance speech. I am now going to take a leaf out his book. If we are lucky enough to win any more awards, I am going to try to single out one or two overlooked gems and talented film makers, and mention them in my speech too. Of course, this all relies on us winning another award and there is no certainty of that at all! I try to remember (though in the excitement of awards and competitions it’s harder to remember), in this life and job, I am not really in competition with anyone else, I am only in a competition with myself – and that competition is to be the very best that can. It’s easy to forget this and get so competitive that I forget to help others, or ask for help from others. Those of you who have watched the blog video from Rhode Island may remember that I had a little epiphany at the closing night screening – for a story teller, the only real award worthy of battle, is the audience reaction, their enjoyment of the yarn that you have spun, and if you are lucky enough, maybe your story touches them in a way that helps them makes some sense out of the meaninglessness they may be encountering in their own lives. I know for a fact that Gone Fishing has this effect with some people, and for me, that is a prize worth fighting for. Dear Nominees, the votes for this years British Thunderclap Award, of which you were in the Official Selection, have now been checked and counted. We had a tremendous response with people from many corners of the world visiting us at www.thunder-clap.com to register their votes for all the films in the Official Selection. It is very clear that the public are looking for something much more than those films which are usually served up in our cinemas and that British independent films have a life, a market and a strong and enthusiastic audience of their own. The British Thunderclap Award was set up to find and publicly recognise the director who, as voted by the British film audience, is producing the most innovative or interesting work in British independent film. Be it in features, shorts, documentaries or fiction, we aim to reward the director who so clearly stamps his or her own individual identity, creativity and vision on an independent film, regardless of budget or professional standing. We would like to congratulate the directors of all seven films in this years Official Selection for being part of The British Thunderclap Award 2008: Vito Rocco, Ben and Chris Blaine, Paul Taylor, Mark James and Phil O'Shea, Jan Manthey, Franny Armstrong and of course Chris Jones. Once again, congratulations to Chris Jones and to all of you for your valuable commitment to film making, for being part of The British Thunderclap Award and for enabling the public to choose their winner and support British independent film. Blimey! So thank you everyone who voted for Gone Fishing, can you believe we secured nearly 50% of the votes. PEOPLE POWER! I also wanted to mention the Blaine Brothers whose film, Hallo Panda, came second – these guys are real stalwarts of the Indie scene and I was honoured to share the competition with them. Next is the British Independant Film Awards on Nov 30th, then the BAFTA and Oscars nominations (fingers and toes crossed)... IT'S GETTING VERY EXCITING! On another note, I also discovered this very nioce write up on co-film maker David Bowen’s blog. If you are having trouble watching this video, try here on Vimeo or here on YouTube. No really, watch it! OK, so it’s all over. We won third prize and I am personally very happy that LEAVING, a powerful, sensitive and incredibly researched and directed film took the first prize. It really is EVERYTHING that this genre of film should be. You can watch a trailer for Leaving here. My real prize last night is that quote from Rutger Hauer, which is very high praise from the guy I watched as a teenager in Blade Runner, thinking, ‘I hope one day I can get to those dizzying heights of film making...’ That will be winging its way to the posters very soon. So now, after editing the video, it's back to bed to nurse my hangover – I am such a lightweight! BLOG UPDATE - Oh and I learned on GREAT tip for the next Guerilla Film Makers Handbook. If you are lucky enough to win an award or festival, if there is a party, loiter by the exit while holding your award – EVERYONE passes you by and feels like saying hello, it’s like power networking! Gone Fishing Nominated for a BIFA! Great news! Were are officially nominated for Best Short Film in the British Independent Film Awards, 2008 (BIFA). This is the eleventh year they are running and the event promises to be both star studded and exciting. Gone Fishing is nominated alongside four other short films, two of which I have seen, and both of which are strong contenders. The awards were announced yesterday in central London by actor, and fan of Gone Fishing, Colin Salmon. The BIFA’s were set up by Raindance in 1998 – I was actually nominated back then for Urban Ghost Story, so it’s really nice to come back a decade later and celebrate again. Since then, it’s grown immensely and is now considered to be one of the most prestigious awards in the UK. Nominees in various categories include Colin Farrell, Kristin Scott Thomas, Sienna Miller, Brendan Gleeson, Keira Knightley, Emma Thompson, Ralph Fiennes, and directors Danny Boyle and Shane Meadows. So you can see, we are truly in amazing company. The awards will take place on November 30th. Now… it’s time to get ready, as tonight it’s the Turner Classic Movies Awards at the National Film Theatre on the Sounth Bank. HOW EXCITING! When I was at the Rhode Island Film Festival, on the opening night when Gone Fishing screened, there was an astonishing animated short film called ‘Varmints’. It was directed by a guy called Marc Craste and self funded. He is part of a commercial animation studio in central London called StudioAKA, and Varmints, again funded by StudioAKA, was clearly a project of deep love. ‘Varmints’ is Marc’s second film, the first ‘JoJo In The Stars’ won a pile of awards, including the BAFTA – you can watch the whole film above. You will see that Marc has a truly unique style, and that the story he weaves, while simple, is still emotional, powerful, tragic and beautiful. For me, this is CINEMA in the purest form. Minimal dialogues, broad emotional strokes, ugly images that are beautiful (and vice versa), characters that I connect with… It’s all great stuff. I hope he manages to pull off a feature one day. You can watch the trailer for Varmints here. Stunning satuff.